CHICAGO (CNS) — When Raiza Guevara first heard about a new program called Pastoral Migratoria coming to the Diocese of Kansas City-St. Joseph, Missouri, she wasn’t sure she wanted to commit the time. Guevara has been an activist pushing for immigration reform for 14 years, and she was already active in her parish, Sacred Heart-Our Lady of Guadalupe, visiting people in jail and serving as an extraordinary minister of holy Communion. She decided to go to the introductory meeting anyway, just to see what it was about. When she heard about immigration ministry described in terms of Catholic social teaching, backed up by Scripture, and when she learned about the commitment of immigrants to take the lead in ministering to members of their own community, she was hooked. She didn’t miss a single formation session, despite taking a fall that put her in a wheelchair for several weeks. When she and those formed with her were commissioned to begin ministry in March, she said she stood in the Cathedral of the Immaculate Conception in Kansas City and felt the Holy Spirit speaking to her. “I knew this is where I am supposed to be,” Guevara said. Guevara was among nearly 30 delegates from 11 dioceses who attended the first Instituto Pastoral Migratoria July 11-15 in Chicago. The delegates came to learn about the parish-based, immigrant-to-immigrant peer ministry that began in the archdiocese 10 years ago. Leaders now want to create a national network of dioceses that use Pastoral Migratoria. The dioceses of Kansas City-St. Joseph and Stockton, California, have pilot projects for the national expansion and they were among those represented at the institute. 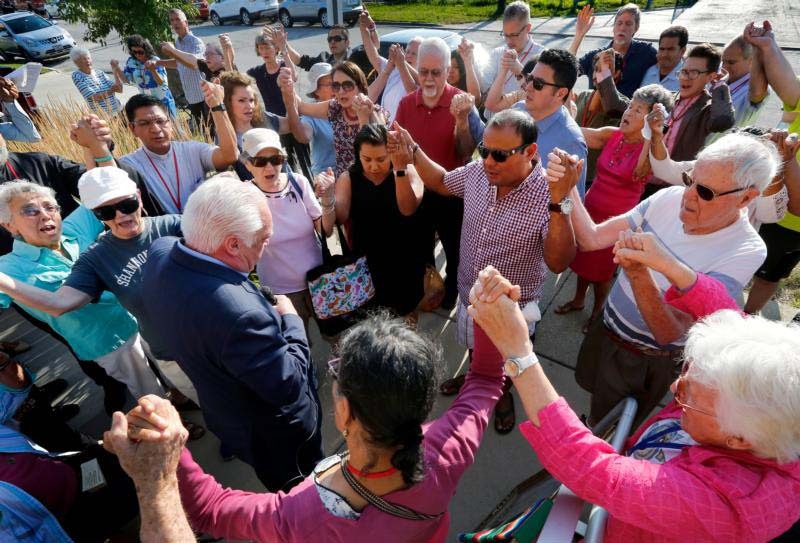 Organizers hope a few more will join them as part of the national Pastoral Migratoria network, said Elena Segura, senior coordinator for immigration for the Archdiocese of Chicago. Other participants can take parts of what they learned and use it in their own diocesan ministries, Segura said. Chicago Cardinal Blase J. Cupich greeted participants July 14 at Catholic Theological Union. “Immigrants are not a problem, they are a blessing,” he told them. “They continue to enrich the life not only of church but of society. The Pastoral Migratoria really emphasizes the fact that we’re not just going to tolerate or minister to people who are newcomers to this country. Father Eric Cruz, who attended from the Archdiocese of New York, said he first learned of Pastoral Migratoria three years ago when Segura did a presentation about it in his archdiocese. When leaders in New York were talking about how to improve immigration ministry there, he suggested they come to the institute. Father Cruz heads up Catholic Charities in the New York borough of the Bronx and serves as a pastor. He said that when he returns, he will try to get support from his brother pastors to start Pastoral Migratoria programs in their parishes. It’s important that the ministry be led by the laity, who can accompany the immigrants they minister to. In the Archdiocese of Chicago, parish Pastoral Migratoria ministers do everything from provide resources and information to bringing in speakers from consulates to organizing peace circles and prayer services. Always they accompany families and individuals on their journeys. “It becomes not what I can do, but what we can do,” Father Cruz said. Marilu Mendez said she wants to see more parishes in her home Diocese of Des Moines, Iowa, take on more comprehensive ministry to immigrants. Mendez, a member of St. Anthony Parish, said that at too many parishes, ministry to immigrants begins and ends with offering sacramental preparation for their children. Guevara said that the thing that has changed most since she was commissioned to do Pastoral Migratoria is the lens through which she sees her efforts to support immigrants. Before starting formation, she already was accompanying the family of a man named Cresencio, who was detained when he went to a check-in with Immigration and Customs Enforcement. She continued to visit him until he was deported in May, and she and the other peer ministers from her parish are still working with his wife and four sons. One of the boys is ill and needs to see a specialist at the children’s hospital every week; the wife, who does not have documents, cannot legally drive in Missouri. The parish has rallied behind them, helping the wife find a part-time job and arranging rides whenever possible. “I think she’s a little stronger now,” Guevara said. At the same time, the first time Guevara left the detention center after visiting Cresencio after being commissioned, she pulled out her rosary and began praying outside the center. As other families arrived, she asked whom they were visiting and if she could pray for them, too. Martin is a staff writer at Chicago Catholic, newspaper of the Archdiocese of Chicago.